The Asylum possess units that have high Hit Points and are generally quick on the adventure map. They are somewhat weak in spellcasting, but have all-around excellent special abilities. The bandit can quickly scout the adventure map for resources, while Nightmares and Black Dragons are recruited from these bonuses. While this unit in battle prove to be average, their capabilities on the adventure map makes their presence worthwhile. It is a good scout, and with it’s stealth ability, a lot of bandits can pounce on an enemy scout, which is usually weak, and the hero would not be likely to have basic scouting. Its main purpose is to steal treasures and resources behind level 1 creatures. Another idea is to station them at mines to increase the scouting radius, and dispels the fog of war, warning you if an enemy is coming. An orc is a slightly above average level 1 creature. It does have its downfalls. It is short range, and has only 6 shots, which isn’t sufficient for a level 1 shooter, especially late in the game, where battles take in excess of 6 turns, but in the unlikely even of a siege, it is potent in towers where the range penalty evaporates. While it has no melee penalty, it fails in its job as a shooter. While some may think that the minotaur pales in comparison to the highly specialised medusa, it does have one nice defensive option at its mercy. The physical block can be one of the most annoying, or most laudable, features of the minotaur. Yes, it has high HP and is a good melee creature, but the physical block does help its cause, but, along with its fairly slow speed and movement, makes it a highly defensive creature. Quite simply the best level 2 ranges attacker in the game. While it isn’t statistically stunning, it does have 3 excellent specials, which make it a formidable opponent. These are normal melee (+stone gaze) unlimited shots, and the stone gaze ability, which does more than freeze the opponents in their tracks - it destroys a number of creatures no matter the HP. A fast and effective unit. While it isn’t superlative in the statistics department, it, like the medusa, has some nice specialties, which, all in all, make it resistant to fire magic, and have a fire shield. This deals a ? of the damage done to it. Its main strength is on the adventure map, with a movement of 29, but is rather ineffective against fire elementals and phoenixes. An excellent creature, which has great potential. While it has the 2nd most HP for a level 3 creature in the game (110), it also has the ability to cast terror upon its opponents. It renders the troop unable to do anything for 2 turns. The terror specialty, in conjunction with nice manoeuvrability and good statistics, makes the nightmare a quality unit. Against wandering creature stacks, it makes sense to split the nightmares into several stacks to make full use of its terror ability. Its main downfall is its exorbitant cost, but for 400 HP and 100% magic resistance, it can often be worth the trouble. It is another fast creature on the adventure map, and proves invaluable against magically oriented towns like Order and Death. Its breath attack can be a double-edged sword, sometimes attacking your own creatures. A Fireguard and Black Dragons are a deadly combination. I must defend my namesake for it is grossly underrated. Many people think of hydras as being useless, slow, defensive garrison creatures. While the last two are correct, hydras can be very attacking, with its multi attack which does affect all units adjacent to it, it packs quite a punch, and the no-retaliation feature helps it to beat armies which may look stronger on paper. On top of this, it has good hit points, a good attack skill, and can deal the most cumulative damage in the game if it is able to attack 8 or so creatures around it. (60 x 8 = 480 damage possible) For 1 Hydra. It can sometimes be held from the action by spells like slow, aging, and fatigue. However, it is tremendous in longer battles, where its specials come into play. It is not overly slow on the adventure map, either. The two main heroes of the Chaos town are Sorcerers and Thieves. Additionally, due to its neighbouring alignments, the Asylum can also recruit a Druid, a Ranger, a Necromancer, and a Death Knight. The perennial tip here is to spread experience around, and to focus on the heroes native to your castle, as you won't incur any morale losses. The Thief is the Might hero of the Chaos town, and is similar to a Bandit in the first stage, but more versatile as it levels up. Firstly, it can gather resources (and experience!) easily by sneaking past enemy creatures. The Thief receives the experience for defeating the wandering creature stack even by sneaking past it, and, for this reason, does not require any creatures for this purpose. This is only possible with advanced stealth, which is an option as soon as the third level. When expert stealth is reached, (by going to the battle academy, dream teacher, etc.) the Thief is able to go behind level 2 creatures undetected, and flag mines and acquire artifacts that greatly contribute to the economy of the town, which is excellent news if you plan to recruit Black Dragons. Additionally, he will gain levels at a quicker pace, through the use of power-ups and treasure chests. This experience can be converted into making him a good scout - he has done his job as a thief (unless you want to sneak past level 4s). Through the use of pathfinding, the thief can perform these tasks much more quickly, and can scour the whole map in a few weeks with the help of his accomplices, the bandits. The Sorcerer is much more inclined to combat than your Might hero, the Thief, thanks to the bevy of offensive and blessing spells Chaos possesses, and due to the fact that the combat skill should be learnt with the Sorcerer to convert him into a Fireguard or Pyromancer with tactics. However, the Chaos spell school is rather narrow, and should be expanded into the death and nature departments later in development at least to the advanced level to give the sorcerer a greater command of spells to use in different situations. Since it is used in combat, the Combat primary skill should be enlisted, as it provides magic resistance and defense to make the hero more durable against spells and physical attacks, should any reach it. 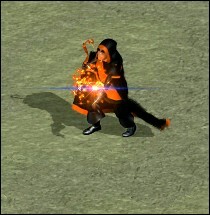 The sorcery skill is merely a dumbed-down version of the pyromancy skill, so always pick the later in preference, but sorcery can still be chosen if there is absolutely nothing else to pick, to increase the damage of spells. Remember that the effectiveness of your Sorcerer is reduced if the Black Dragon is chosen, in this case, focus on direct-damage spells and the pyromancy skill, and not so much on spells like cat-reflexes. A good indicator of town build speed is the day in which the player can purchase the level 3 creature dwelling (similar to Heroes III where it was the level 6 dwelling). In the Chaos faction, the combination of Day 1: Statuary Garden Day 2: Caravan Day 3: Black Wood if resources are plentiful. Another downfall of building the Labyrinth is the extra pre-requisite of the Thieves' Gauntlet, compared with that of the Mage Guild level 1, which would have to be built quickly for the Sorcerer anyway, but is usually pre-built. The Volcanic Vent requires the blacksmith, while the Black Wood needs the Caravan. They are of equal importance, as the Blacksmith yields immortality potions, but, on larger maps, the caravan usually has the edge, especially if you choose Hydras which are slower on the adventure map (Nightmares are slower than Efreeti). The level 4 dwellings both require a spell annex, and this choice can be influenced by the Sorcerer hero choosing nature or death magic. The 30 sulfur needed for the Dragon Cave takes a while to accumulate, but this is hastened if building the Black Wood since it does not require sulfur like the Volcanic Vent. The difficulty with the Hydra dwelling is the different types of resources. While not as much of one resource is needed, to build the Hydra Pond, crystal, mercury, and sulfur are required. This means an extra 2 mines need to be flagged on the adventure map. Many a time, the building of the level 4 structure boils down to the availability of a sulfur mine. However, the Thief can be used to scour for mines and resources for a short time, there is the additional problem of providing 4 sulfur for every Black Dragon, so this cost must be kept in mind for the future. Of Asylum's specialty buildings, the Battle Academy is generally the most useful. Its relatively cheap cost and the fact that it does not tax any of Chaos' premier resources of sulfur and mercury. It is most effective early in the game to help develop the Thief hero as a kick start for his growth to expert stealth. The Thieves Gauntlet is an inherently good structure, but since Chaos' combat hero is magical, this has limited effects, succeeding only in building up his physical resistance. The mana vortex is also useful, but should only be purchased later in the game where the premier resources are not as vital. The Asylum, traditionally a slow moving town, is bolstered by the stealth of bandits and Thieves, which are really the town's saviours in the early game. The Thief, after having cleared the map of loose resources and mines with Expert Stealth after a couple of weeks, should focus on its pathfinding skill, which provides an extra 50% movement over hostile terrain at Grandmaster level. However, in a map with varying terrains, even the basic level is worthwhile, and it allows the Thief to clear the map much more quickly. Being able to acquire resources quickly is a vital factor in town build speed. Additionally, after your creatures have been recruited, you can add the then developed thief to your main army to help it reach its location, acting as a turbo if you will. Since the thief is not designed for combat, take it out of the army and continue searching the map in a new area, and gaining experience points in a perhaps undiscovered area, making the Thief more effective for this task later on. The adventure map movement of Chaos creatures on the adventure map are fairly similar, apart from when it comes to Efreets and Black Dragons, who have 29 and 30 respectively. For the speed of the army, it is favourable to have at least one of these creatures in your leading army. The next highest is 23 with bandits, who are obligatory, and should be in the leading army, if not for pestering more powerful creatures (by attacking them and wasting their retaliation). Nightmares also have 23, only 6 less than the Efreet, compared to 9 less for the Hydra against the Black Dragon. So, on larger maps, the combination of a Black Dragon and Efreet should prevail, especially for your Sorcerer hero, who can be a Fireguard, and thus very resilient against fire spells. But, the Thief can also be used to speed the leading army up. On smaller maps, it is not so important after the initial stages involving the Thief, and a combination can be recruited.